Fifa's report into allegations of corruption during the bidding process for the 2018 and 2022 World Cups has been questioned - by the man who investigated claims of wrongdoing. Michael Garcia, who conducted a two-year inquiry, said the report "contains numerous materially incomplete and erroneous representations". The report cleared World Cup hosts Russia and Qatar of wrongdoing. It also accused the English Football Association of flouting bid rules. But Garcia's statement, issued less than four hours after the report was published, has reopened the debate about the validity of the bidding process for both the 2018 and 2022 competitions. Simon Johnson, who led England's 2018 bid team, described the twist in the saga as "farcical". Speaking to BBC sports editor Dan Roan, he added: "Before that statement by Mr Garcia, I was saying that it's very difficult to have confidence in the conclusions of Mr Eckert's report and that it looked like a politically motivated whitewash. "Now that I have seen Mr Garcia's statement, I am absolutely convinced that the report is a politically motivated whitewash." Garcia's statement will embarrass Fifa and raise concerns about the work of Hans-Joachim Eckert. Fifa's independent ethics adjudicator was responsible for drawing up the report that was published by Fifa at 0900 GMT on Thursday. Eckert based his findings on the work of Garcia, who had been appointed by Fifa to conduct an independent investigation into claims of corruption. "My job is to punish people who do bad things"
Appointed by President Bush, married to an FBI agent and barred from entering Russia - BBC News profiles American lawyer Michael Garcia, the man behind the Fifa corruption report. But Garcia, a former United States federal prosecutor, says Eckert, a German judge, has erred and plans to appeal, a move that Fifa secretary general Jerome Valcke described as "sad". Fifa had hoped Eckert's report would bring closure to what has been a damaging episode, but there are now calls for Garcia's own report, which runs into hundreds of pages, to be published in full. "Fifa has no choice but to publish Michael Garcia's report in full if it expects anyone to believe their claims that there has been no cover-up over allegations of corruption in the World Cup bidding process," said British MP Clive Efford, Labour's Shadow Minister for Sport. Another British MP, Damien Collins, had already labelled Eckert's report "a whitewash" before Garcia's statement was issued. Collins has campaigned for Fifa reform and in 2011 used Parliamentary privilege to allege that bribes helped secure Qatar the 2022 tournament. He said those allegations remained unanswered. "It is a whitewash as it is an attempt to con people that there has been a full and independent investigation when there has not been," he said. "The result is that allegations of bribery and serious wrongdoing remain unanswered and they are still suppressing the full report." 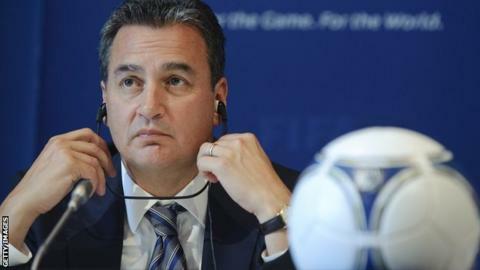 Following the publication of Eckert's report, Britain's Fifa vice-president Jim Boyce said it was now time to move on. However, his stance changed after Garcia's statement. "In view of the fact Michael Garcia has now stated he is not happy with the findings and is to appeal, I await with interest to see what further disclosures will be made," said Boyce. "I have always said as much of the report as it is legally possible to publish should be made public." Qatar's bid team has always denied allegations of corruption. The decision to award the 2022 World Cup to the Gulf state was a big surprise, given Fifa's own technical team warned that summer temperatures were too high for players. As for Russia, Alexey Sorokin, the chief of its 2018 World Cup organising committee, said the country had nothing to hide. "We were always confident that there could be nothing which would come out from this investigation," Sorokin told Sky Sports News. "It's something Fifa deemed important to do. It was done, we participated, we complied. What more can we do?" Following the publication of the report, the English FA rejected the criticism levelled at it, insisting it had "conducted a transparent bid". It was accused of trying to "curry favour" with former Fifa vice-president Jack Warner, who quit his role in 2011 amid bribery allegations, and of damaging Fifa's image. An FA statement read: "We do not accept any criticism regarding the integrity of England's bid or any of the individuals involved." Lord Triesman, a former FA chairman, was also criticised by Eckert's report for failing to co-operate with the inquiry. However, Triesman claimed he was advised not to by his own legal team and also hit back at the report's findings, although he said the criticism of the FA bid was both "legitimate" and "embarrassing". "I think that the report is extraordinary," he told BBC Sport. "It reflects the fact that, in Fifa, there is a great dislike of England. "But the crucial thing here is that the evidence is never really going to be produced in a way it would be in a proper court of law. "For those reasons, who did what and how badly they behaved is never going to be that clear." Current FA chairman Greg Dyke also registered his unhappiness with Fifa's report, claiming it left unanswered questions. "If you read that report, it says all the bids were assessed," said Dyke. "The one that was the highest risk was Qatar and they won." Asked if the FA had damaged the image of football's world governing body, Dyke said: "I think it's quite hard to damage the image of Fifa."